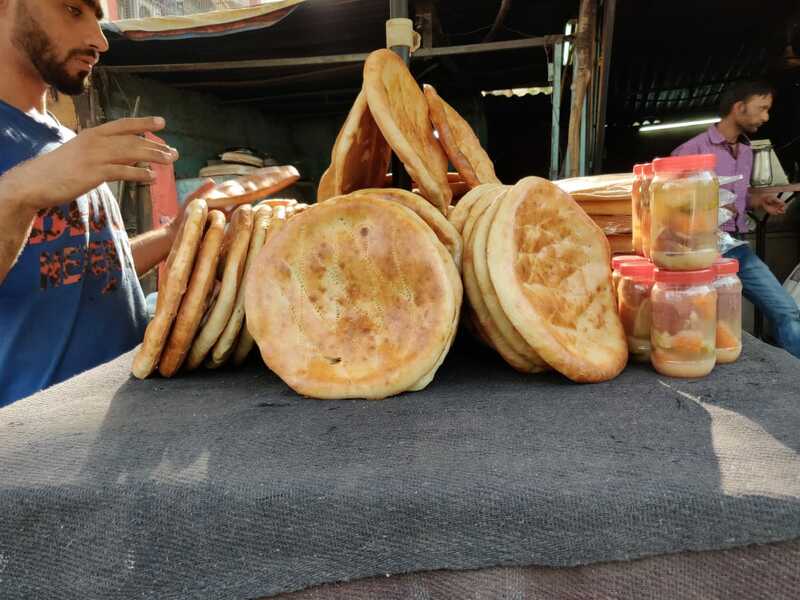 Quite close to the hustle bustle of the ever so busy Central Market in Lajpat Nagar, there is a quaint and quiet lane which teleports you straight to Afghanistan and introduces you to the art of Afghan bread-making. Located right across the market road, this lane is known as Afghan street and it’s easy to understand why. Almost all the shops have signboards written in English, but predominantly in Dari. And a lot of those shops are Afghan eateries, some of them restaurants and some street food stalls. As you walk down the lane, you’re hit with the familiar smell of freshly baked bread and rich butter. For someone like me who loves the aromas of baking, it felt like walking in paradise. 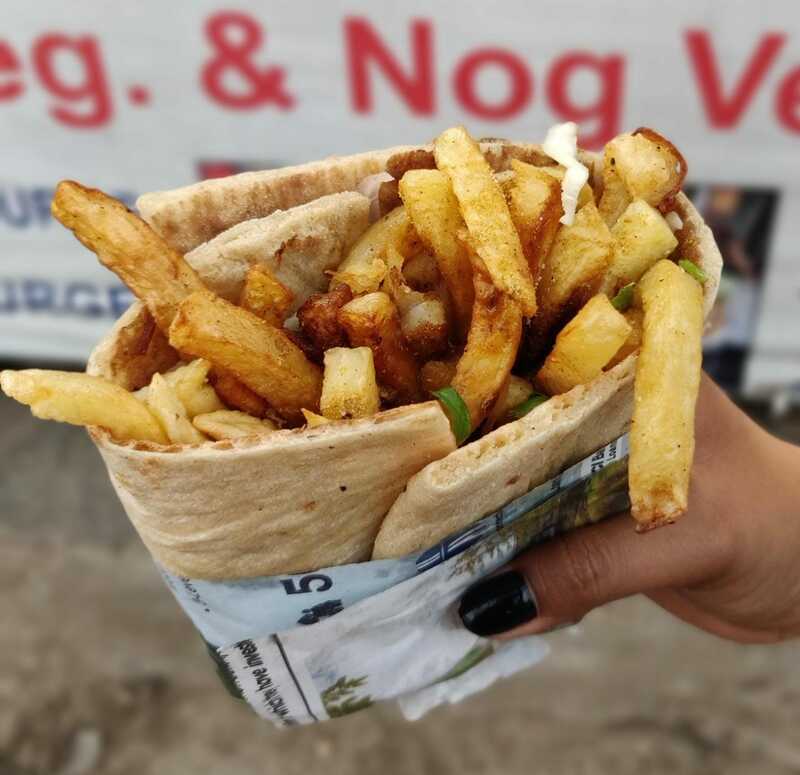 At one of the street stalls, you see a vendor serving out an intriguing dish that looks like a curious cross between a burger and a wrap. Below the tiny counter, the signboard said Afghan burger, veg and non veg. I asked for a veg Afghan burger and Afghan Lassi, but unfortunately they weren’t serving the Lassi. Another vendor at the neighboring stall told us they’ll start serving it after Ramzan. The veg Burger was for ₹50 and the non-veg burger was for ₹ 100. They also had heaps of bread resting on a table, that were coming straight out of the tandoor (clay oven) nearby. The breads smelled divine and they only cost TWENTY rupees. On the table, you will find jars of pickle that looked like large chunks of diced vegetables drenched in vinegar. The pickles looked fresh and cost only 50 bucks. There were also sheermals and Afghan cakes for 100 rupees each. So now coming to the main attraction of the shop, the Afghan burger is unlike any ‘Burger’ you’ve had before. It’s a thick, large Roti or lavassa bread encasing soft potato fries, perfectly seasoned and garnished with coriander leaves. Then, some kind of red sauce is drizzled on top of the burger, and voila our afghan burger is ready. The burger tasted fresh and soft, but it was a bit too dry for my taste. The sauce used is made with a blend of tomatoes, garlic, vinegar, red chili and capsicum. And while the sauce adds a bit of zest and tantalizing flavor to the burger, the quantity of the sauce used was somewhat underwhelming for me. I would have preferred more of it. They put egg in the veg burger so if you don’t eat eggs, you have to let them know while placing the order. You can also see beautifully marinated chicken stocked up to be put in the non-veg burgers, so you should try that too if you eat meat. One burger is totally sufficient for a single person, as it’s more than a handful. Bring a friend along if you know you can’t finish large sided portions of food, because this one is not for those with little tummies. The burger is extremely fulfilling and scrumptious. You’re guaranteed to go home with your hunger satiated and all that without burning a hole into your pocket.